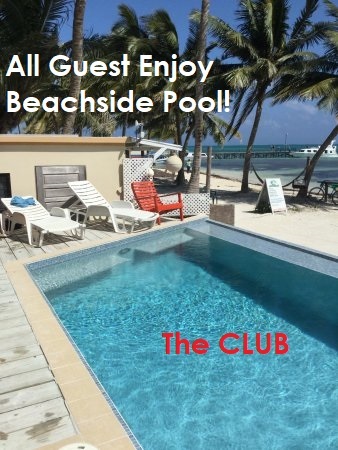 The Club is a Beach Resort located on a private beach on Caye Caulker and steps away from both the Ocean Ferry Water Taxi and the Village Center. Originally founded in 1978 as "Popeye's Bar, a Pirate Themed Bar with a few guest cabanas- it has grown to be a full size Beach Resort and a true icon of the Caye Caulker Island resting on the shores of the Caribbean Shores. Today The Club occupies a large piece of private beach front accommodations from Dorm Style Youth Rooms, Private Rooms and Breathtaking Condominiums. Units at The Club are mostly owned by individuals as Vacation Condo's. Small Hotel Style Rooms all the way to 2 Bedroom Condos with Private Balconies and a full list of Amenities you would find in a well stocked home can be found at The Club! Our philosophy in approaching the vacation traveler is different then most hotels and resorts. We strongly believe that all walks of life enjoy a good, if not great , value while on a vacation. We also feel a well heeled vacationer that wants the privacy of water front condo will enjoy rubbing elbows with a world traveling back packer while they meet at the Breakfast Bar. Thus, we strive to provide a broad spectrum of room types and budget types for private uses. yet, we have all the amenities of a full Beach Resort and want all of our guest to enjoy our facility , pool, docks, beach and breakfast, no matter what rate they paid. All Guest will enjoy use of the private dock, Free Breakfast Served Daily at the outdoor Breakfast Bar. The Resort Pool which sets right into the Beach Front.